For years, Universal Studios has left the nighttime fireworks spectaculars to its competition to the south but in 2012 the theme park launched its Universal’s Cinematic Spectacular fireworks and fountain show to celebrate the movie studio’s 100th anniversary. Universal’s Cinematic Spectacular is a fireworks show that celebrates 100 years of cinematic memories of Universal Studios films that consists of a series of movie clips projected against large water screens as fountains and fireworks are synchronized to music played throughout the park. 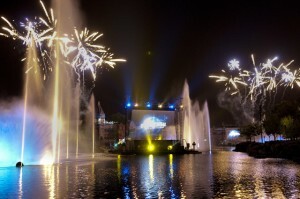 The show relies heavily on the movie clips and dancing fountains shown during the spectacular. Shortly after Universal Studios opened in Orlando, a nightly stunt show was once held in the center of the lagoon and more recently a projection show that showed movie clips onto giant spheres but the cinematic spectacular is Universal’s most ambitious nighttime experience since the parks opening. 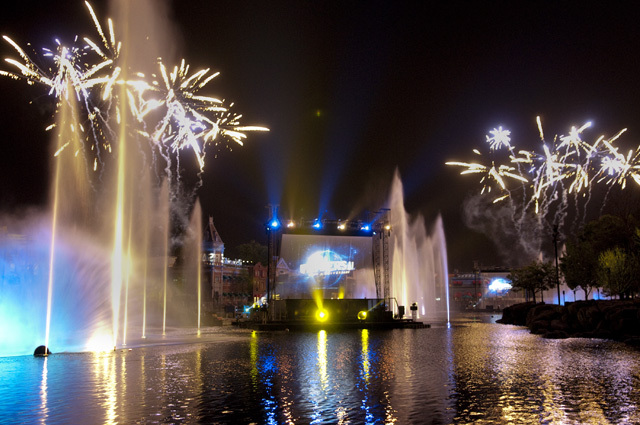 Jim Timon, Senior Vice President of Entertainment for Universal Orlando Resort describes the fireworks show as “…the most powerful tribute to film you could imagine”. Academy Award-winning actor Morgan Freeman narrates the show that is around 18 minutes in length and features scenes from such popular movies that have attractions at the park like Jurassic Park, The Mummy, and E.T: The Extra Terrestrial. Other movie scenes include the comedy film American Pie, action movies The Bourne Ultimatum and The Fast and the Furious, and the classic To Kill a Mockingbird. Also, whereas former nighttime shows at Universal were only held during the peak season of summer and the holidays, Universal’s Cinematic Spectacular is held almost every night year-round. With the steps of Universal Studios choosing to have the spectacular shown year-round, the theme park will begin to be thought of a nighttime theme park destination similar to how Illuminations at Epcot, Wishes at the Magic Kingdom, and Fantasmic! at Hollywood Studios keep visitors at the parks at Disney World on most nights throughout the year. Whereas the Disney shows at Universal have a little more pyrotechnic or more character entertainment contained within their night-time shows, this is definitely a step in the right direction for Universal to help keep its visitors in the park at night. Click here for more information about other fireworks shows around Orlando throughout the year and here for more stories about Universal Orlando. This entry was posted in Attractions and tagged fireworks, shows, universal, universal studios. Bookmark the permalink.